Nurture plays a large role in determining what an individual’s personality and character develops into. The environment your children are in can heavily influence their habits and thought patterns—just like your childhood environment influenced yours. 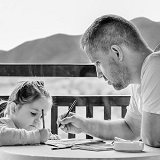 By giving your children a positive role model, as well as productive activities to channel their energy into, you give them healthy outlets through which they can express themselves and learn social and decision-making skills. Furthermore, by acknowledging their perspectives, you can foster a close bond between the two of you. Give your children positive role models. Give them someone to look up to and emulate. Provide your children with productive activities they can channel their energy into. For example, sign them up for extracurricular sports. Try to see the world from your child’s point of view. Try not to project your own preferences onto your child; instead, try to see things from their perspective so you can understand them a little better.